An intensive search for Sciarosoma borealis Chandler resulted in the identification of numerous individuals in unsorted Malaise samples from Sweden and Finland. These new records, including the first finds in Sweden, are documented. The morphology of Sciarosoma males is redescribed and females are described for the first time. In the light of these new data, the distribution and phenology of Sciarosoma in Fennoscandia is reviewed. Recent attempts to classify Sciarosoma within the family Sciaridae in a new, broad sense are critically examined. Im Ergebnis intensiver Nachsuche in unbearbeitetem Malaisefallen-Material konnten mehrere neue Nachweise für Sciarosoma borealis Chandler aus Schweden und Finnland erbracht werden. Für Schweden sind es die ersten dokumentierten Funde überhaupt. Die Beschreibung des Männchens von Sciarosoma wird ergänzt; das Weibchen wird erstmalig beschrieben. Unter Einbeziehung dieser neuen Daten wird die Verbreitung und Phenologie dieser Art in Fennoskandien dargestellt. Jüngste Bestrebungen, Sciarosoma innerhalb eines erweiterten Familienkonzeptes der Sciaridae zu klassifizieren, werden kritisch beleuchtet. A review of the Palaearctic species belonging to the Boletina nitida-group is given. A new species, Boletina insulana spec. nov. from the Russian Far East, is described. Descriptions and illustrations of the male genitalia of five species (B. bidenticulata Sasakawa & Kimura, B. dispecta Dziedzicki, B. gusakovae Zaitzev, B. nitida Grzegorzek and B. rejecta Edwards) are given. An identification key for the nine species of the Boletina nitida-group currently known from the Palaearctic region, based mainly on the male genitalia and new distribution data are provided. Es wird ein Überblick über die paläarktischen Arten der Boletina nitida-Gruppe gegeben. Neun Spezies sind nunmehr aus dieser Region bekannt. Boletina insulana spec. nov. wird als neu für die Wissenschaft beschrieben. Es werden die Beschreibungen und Illustrationen der Genitalien der Männchen von fünf Arten (B. bidenticulata Sasakawa & Kimura, B. dispecta Dziedzicki, B. gusakovae Zaitzev, B. nitida Grzegorzek und B. rejecta Edwards) aufgeführt. Ein Bestimmungschlüssel, der vornehmlich auf der Struktur der männlichen Genitalien basiert, wurde erarbeitet. The species of fungus gnats (Bolitophilidae, Diadocidiidae, Ditomyiidae, Keroplatidae and Mycetophilidae) occurring in Greece and Cyprus are reviewed. Altogether 201 species are recorded, 189 for Greece and 69 for Cyprus. Of these 126 species are newly recorded for Greece and 36 are newly recorded for Cyprus. The following new taxa are described from Greece: Macrorrhyncha ibis spec. nov., M. pelargos spec. nov., M. laconica spec. nov., Macrocera critica spec. nov., Docosia cephaloniae spec. nov., D. enos spec. nov., D. pasiphae spec. nov., Megophthalmidia illyrica spec. nov., M. ionica spec. nov., M. pytho spec. nov., Mycomya thrakis spec. nov., Allocotocera scheria spec. nov., Sciophila pandora spec. nov., Rymosia labyrinthos spec. nov.; M. illyrica is also recorded from Croatia. The following new taxa are described from Cyprus: Macrocera cypriaca spec. nov., Megophthalmidia alnicola spec. nov., M. cedricola spec. nov. The following new synonymies are proposed: Mycomya tenuis (Walker, 1856) = M. intermissa Plassmann, 1984 syn. nov., Phronia willistoni Dziedzicki, 1889 = P. incisa Caspers, 1991 syn. nov. A key is provided for the western Palaearctic species of Macrorrhyncha Winnertz. The composition of the fauna of these families in Greece and Cyprus is discussed in relation to the Mediterranean and to the wider distribution of genera and species. 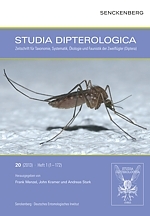 Vorliegende Publikation hat die in Griechenland und Zypern vorkommenden Pilzmücken (Bolitophilidae, Diadocidiidae, Ditomyiidae, Keroplatidae und Mycetophilidae) zum Gegenstand. Insgesamt werden 201 Arten gemeldet, 189 aus Griechenland und 69 aus Zypern. Von diesen werden 126 erstmals für die Fauna Griechenlands und 36 erstmals für die zypriotische Fauna registriert. Folgende neue Arten werden aus Griechenland beschrieben: Macrorrhyncha ibis spec. nov., M. pelargos spec. nov., M. laconica spec. nov., Macrocera critica spec. nov., Docosia cephaloniae spec. nov., D. enos spec. nov., D. pasiphae spec. nov., Megophthalmidia illyrica spec. nov., M. ionica spec. nov., M. pytho spec. nov., Mycomya thrakis spec. nov., Allocotocera scheria spec. nov., Sciophila pandora spec. nov., Rymosia labyrinthos spec. nov.; M. illyrica wird auch aus Kroatien gemeldet. Folgende Arten werden aus Zypern beschrieben: Macrocera cypriaca spec. nov., Megophthalmidia alnicola spec. nov., M. cedricola spec. nov. Die nachfolgenden neuen Synonyme ergaben sich aus der Bearbeitung des Materials: Mycomya tenuis (Walker, 1856) = M. intermissa Plassmann, 1984 syn. nov., Phronia willistoni Dziedzicki, 1889 = P. incisa Caspers, 1991 syn. nov. Es wurde ein Bestimmungsschlüssel der westpaläarktischen Arten der Gattung Macrorrhyncha Winnertz erarbeitet. Die Zusammensetzung der Fauna dieser Familien in Griechenland und Zypern wird im Vergleich zu jener in der Mediterraneis diskutiert und erweitert die Informationen zum Vorkommen der Gattungen und Arten. Two new species of Lonchaeidae, Silba nepalensis spec. nov. and Lonchaea silbacola spec. nov. are described on the basis of specimens collected in Nepal and Afghanistan. Zwei neue Arten aus der Familie der Lonchaeidae, Silba nepalensis spec. nov. und Lonchaea silbacola spec. nov., werden anhand von Individuen, die aus Nepal und Afghanistan stammen, beschrieben. Orthonevra karnaliensis spec. nov. is described from altitudes between 2700 and 3500 m a.s.l. in the Nepal-Himalayas (provinces Karnali and Seti). The relationships of the new species and its distinction from similar species are discussed. The Oriental species O. indica Brunetti, 1915 and O. aenethorax Kohli, Kapoor & Gupta, 1988 are not considered to belong to the genus Orthonevra. Orthonevra karnaliensis spec. nov. wird von Lagen zwischen 2700 und 3500 m NN aus dem Nepal-Himalaya (Provinzen Karnali und Seti) beschrieben. Die Verwandtschaftsbeziehungen der neuen Art und ihre Unterscheidung von ähnlichen Arten werden diskutiert. Die orientalischen Arten O. indica Brunetti, 1915 und O. aenethorax Kohli, Kapoor & Gupta, 1988 werden als nicht zur Gattung Orthonevra gehörig betrachtet. Abdominal modifications in Crossopalpus hirsutipes Collin, 1960 and C. aeneus (Walker, 1871) have been re-examined and illustrated. These paired structures are normally hidden below the posterior edge of third tergite but became expanded in macerated specimens and then resemble a shaving brush. The possible function of these structures is briefly discussed. Crossopalpus hirsutipes is recorded from Vietnam and Cambodia for the first time. A diagnosis of this species and figures of the male terminalia are provided. Besondere morphologische Bildungen am Abdomen von Crossopalpus hirsutipes Collin, 1960 und C. aeneus (Walker, 1871) werden neu untersucht und abgebildet. Diese paarigen Strukturen sind normalerweise unter dem hinteren Rand des dritten Tergites verborgen, expandieren aber bei mazerierten Exemplaren und ähneln dann einem Rasierpinsel. Ihre mögliche Funktion wird kurz diskutiert. Darüber hinaus wird Crossopalpus hirsutipes aus Vietnam und Kambodscha erstmals gemeldet. Eine Diagnose dieser Art wird nebst Abbildungen der männlichen Terminalia gegeben. The taxonomy and distribution of the Palaearctic genus Therioplectes are reviewed. For each species, the diagnostic features, the variability and the distribution-pattern are discussed. Based on new evidence, Th. gigas and tunicatus are retained as two separate species. New records from Turkey are provided for Th. griseus and kuehlhorni, species previously known only from the type specimens. Die Taxonomie und Verbreitung der paläarktischen Gattung Therioplectes wird einer Revison unterzogen. Für jede Art werden die Merkmale, die Variabilität und die Verbreitung besprochen. Therioplectes gigas und Th. tunicatus werden als distinkte Arten aufgefasst. Von den bislang nur vom Typenmaterial her bekannten Spezies Th. griseus und Th. kuehlhorni werden neue Funde aus der Türkei gemeldet. Larvae of Megaselia minor have been found to develop inside dead adults of Pentatoma rufipes and Palomena spec. (Heteroptera: Pentatomidae) that were killed by a common fungal entomopathogen, Beauveria bassiana. Hyphae of B. bassiana growing inside the pentatomid cadavers seemingly served as the food of the M. minor larvae. In a single cadaver, from 2 to 11 phorid larvae have been recorded. Some of these larvae were parasitized by Orthostigma cratospilum (Hymenoptera: Braconidae). In Imagines von Pentatoma rufipes und Palomena spec. (Heteroptera: Pentatomidae), die durch einen weitverbreiteten entomopathogenen Pilz, Beauveria bassiana, getötet worden waren, fanden sich Larven der Buckelfliege Megaselia minor. Die Hyphen des Pilzes, die im Inneren des Wirtes wuchsen, dienten offensichtlich den Dipterenlarven als Nahrung. In einer einzelnen toten Pentatomide wurden jeweils 2-11 Phoridenlarven gefunden. Einige dieser Larven waren durch Orthostigma cratospilum (Hymenoptera: Braconidae) parasitiert. Records of 55 species from the Harz mountains in the collection of Willy Schlüter et al. (Museum of Nature Gotha) are given. Most of the specimens are more than 65 years old and some were added after Schlüters death. The hoverfly Brachypalpus chrysites is the first record for Saxony-Anhalt and the robber fly Cyrtopogon maculipennis is new for Lower Saxony. Details of his entomological activity are added to the biography of the ornithologist and penultimate owner of Schlüter naturalist’s business (Halle/Saale), which achieved world wide renown in the first part of the last century. Von 55 Arten aus sieben Dipteren-Familien werden Belege zur Fauna des Harzes aus der Sammlung Willy Schlüter et al. des Museums der Natur Gotha aufgeführt. Die meisten Präparate sind älter als 65 Jahre. Einige Exemplare wurden nach Schlüters Tod hinzugefügt. Die Schwebfliege Brachypalpus chrysites wird erstmals für Sachsen-Anhalt und die Raubfliege Cyrtopogon maculipennis erstmals für Niedersachsen erwähnt. Die Daten aus dem Leben des Ornithologen und vorletzten Eigentümers der Naturalienhandlung Schlüter aus Halle/Saale, die in der ersten Hälfte des vergangenen Jahrhunderts Weltberühmtheit erlangte, werden um seine entomologische Betätigung ergänzt. The taxonomy of the Physocephala rufipes species-group is discussed and a key for the nine Palaearctic species is presented. New taxonomic results are set out: Physocephala nigripennis spec. nov. is described from Taiwan and Physocephala confusa spec. nov. is described from China. Lectotypes are designated for Physocephala obscura Kröber, 1915 and Physocephala bicolor Brunetti, 1923. Five new synonyms are proposed: Physocephala scutellata Kröber, 1915 = Physocephala bicolor Brunetti, 1923, syn. nov.; Physocephala rufifrons Camras, 1960 = Physocephala robusta Zimina, 1974, syn. nov.; Physocephala gigas (Macquart, 1843) = Physocephala lugens Vollenhoven, 1863, syn. nov. = Physocephala ammophiliformis Kröber, 1915, syn. nov.; Physocephala obscura Kröber, 1915 = Physocephala jezoensis Matsumura, 1916, syn. nov. Die Abgrenzung der Physocephala rufipes-Artengruppe wird dargestellt und ein Bestimmungsschlüssel für die neun paläarktischen Arten wird vorgelegt. Folgende taxonomische Ergebnisse werden präsentiert: Physocephala nigripennis spec. nov. wird aus Taiwan beschrieben, Physocephala confusa spec. nov. wird aus China beschrieben. Für Physocephala obscura Kröber, 1915 und Physocephala bicolor Brunetti, 1923 werden Lectotypen festgelegt. Es werden fünf neue Synonyme eingeführt: Physocephala scutellata Kröber, 1915 = Physocephala bicolor Brunetti, 1923, syn. nov.; Physocephala rufifrons Camras, 1960 = Physocephala robusta Zimina, 1974, syn. nov.; Physocephala gigas (Macquart, 1843) = Physocephala lugens Vollenhoven, 1863, syn. nov. = Physocephala ammophiliformis Kröber, 1915, syn. nov.; Physocephala obscura Kröber, 1915 = Physocephala jezoensis Matsumura, 1916, syn. nov. This article reports on a study visit to Madagascar which took place from 26th October to 16th November 2003. Seven scientists from Berlin, Bonn, Eberswalde, Flensburg, Müncheberg and Munich (Germany) took part in the journey. The members of the team made observations primarily on selected groups of insects in the orders Diptera, Heteroptera and Hymenoptera, at various localities in Central and South Madagascar. The route taken by the expe-dition and the most important locations are shown on a map. The itinerary and impressions of the journey are given in a general report on the visit and the text is illustrated with numerous colour photographs. In dem Artikel wird von einer Studienreise nach Madagaskar berichtet, die vom 26. Oktober bis zum 16. November 2003 stattfand. An der Reise nahmen 7 Wissenschaftler(innen) aus Berlin, Bonn, Eberswalde, Flensburg, Müncheberg und München (Deutschland) teil. An verschiedenen Lokalitäten Mittel- und Südmadagaskars wurden von den Expeditionsteilnehmern vorrangig ausgewählte Insektengruppen aus den Ordnungen Diptera, Heteroptera und Hymenoptera beobachtet. Die Reiseroute und die wichtigsten Stationen werden in einer Übersichtskarte dargestellt. Der Expeditionsverlauf und die Reiseeindrücke wurden in einem allgemeinen Erlebnisbericht wiedergegeben. Außerdem wird der Text durch zahlreiche Farbfotos veranschaulicht. The insect visitors to Gentiana spp. and Campanula spp., which have blue or yellow-bell-shaped flowers and are adapted for bumblebee pollinators, were observed in the mountains of SW Bulgaria: Mt. Vitosha, Rila Mts, Pirin Mts, Western Stara Planina Mts and Mt. Ljulin during the period July to September in the years 1989 to 1998 and at altitudes between 1000 m and 2000 m. Flies of the genus Thricops showed a high level of visitor activity, and occurred significantly more often than coadaptively specialised pollinators such as bumblebees in the flowers of Gentiana pyrenaica L., Campanula patula L., and some populations of C. rotundifolia L. complex. They were also numerous in the flowers of Gentiana lutea L. subsp. symphyandra (Murb.) Hayek; G. punctata L. and G. asclepiadea L. These flies were hardly ever observed in the flowers of Gentiana verna L., G. utriculosa L., G. nivalis L., G. pneumonanthe L. and G. cruciata L. as well as Campanula trachelium L., C. rapunculoides L. and C. bononiensis L. which are sympatric with G. cruciata. Plant choice and the distribution in space and time of Thricops spp. are discussed. The flies remained active even in cool and wet weather when bumblebees were absent. Thricops flies contribute to the separation of male and female stages of gentian flowers as they are pollen eaters and thus help to prevent self-pollination. In den Bergen SW-Bulgariens (Vitosha-, Rila-, Pirin- und dem westlichen Stara Planina-Gebirge sowie dem Berg Ljulin) wurde von Juli bis September in den Jahren 1989-1998 in Höhenlagen von 1000-2000 m untersucht, welche Insekten die an Bestäubung durch Hummeln adaptierten glockenförmigen blauen oder gelben Blüten verschiedener Gentiana- und Campanula-Arten spp. besuchen. Fliegen der Gattung Thricops wiesen ein hohe Aktivität als Blütenbesucher auf. Sie besuchten signifikant öfter die Blüten von Gentiana pyrenaica L., Campanula patula L. und einiger Populationen des C. rotundifolia L.-Komplexes als die als coadaptiv an diese Blüten angepassten Hummeln. Häufig waren Thricops-Arten auch an den Blüten von Gentiana lutea L. subsp. symphyandra (Murb.) Hayek, G. punctata L. und G. asclepiadea L. zu finden. Fast garnicht waren sie hingegen an Gentiana verna L., G. utriculosa L., G. nivalis L., G. pneumonanthe L. und G. cruciata L. anzutreffen und auch die mit der letztgenannten Spezies sympatrischen Arten Campanula trachelium L., C. rapunculoides L. und C. bononiensis L. wurden nicht aufgesucht. Die Gründe für die Auswahl bestimmter Pflanzenarten und das örtliche und saisonale Auftreten von Thricops spp. werden diskutiert. Diese Dipteren sind auch unter kalten und feuchten Wetterbedingungen aktiv, wenn Humnmeln nicht mehr fliegen. Thricops spp. tragen als Pollenfresser dazu bei, die männlichen und weiblichen Bestandteile der Enzianblüten zu separieren und helfen somit, Selbstbefruchtung der Blüten zu vermeiden. The third stage larvae and puparia of Ornidia major Curran, 1930, Ornidia whiteheadi Thompson, 1991, and Ornidia obesa (Fabricius 1775) are compared and a set of shared characters described. The genus is distinguished from other volucelline taxa, and its key characters discussed and illustrated. Based on larvae and puparia, a key is provided to identify Ornidia Lepeletier & Serville, 1828 and each larva and puparium of the three species considered here. Breeding sites and rearing data are also given. Das dritte Larvenstadium und das Puparium folgender Ornidia-Arten werden verglichen und eine Anzahl gemeinsamer Merkmale herausgearbeitet: O. major Curran, 1930; O. whiteheadi Thompson, 1991 und O. obesa (Fabricius, 1775). Die Gattung wird von anderen Taxa der Volucellinae abgegrenzt und wichtige Merkmale werden diskutiert und abgebildet. Ein auf den Larven und Puparien basierender Bestimmungsschlüssel mit dessen Hilfe Ornidia Lepeletier & Serville 1828 als Gattung, sowie jede der obengenannten Stadien aller drei Arten zu bestimmen ist, ergänzt die Publikation. Es werden auch Informationen zu den Larvalhabitaten und zu Zuchtergebnissen gegeben. The male of Agromyza viciae Kaltenbach, 1872 is described and the genitalia illustrated. Distribution records are given including the first records from Britain and Norway. Descriptions of mines, larvae, puparia, and new morphological details of the adults are put together with a worldwide phylogenetic view on the A. rufipes-group. A thorough review of the literature includes the parasitoids and all known details of the species. Das Männchen von Agromyza viciae Kaltenbach, 1872 wird beschrieben und die Struktur der Genitalien abgebildet. Angaben zur Verbreitung der Art umfassen auch erste Nachweise aus Großbritannien und Norwegen. Die Minen, Larven und Puparien werden charakterisiert sowie gemeinsam mit neuen Details zur Morphologie der Imagines zu einer Gesamtschau der A. rufipes-Gruppe aus phylogenetischer Sicht vereint. Eine gründliche Übersicht zum Schrifttum über A. viciae schließt auch Angaben zu den Parasitoiden und alle weiteren in der Literatur erwähnten Details zu dieser Spezies ein. Three recent works of Andy Z. Lehrer are reviewed, with a main emphasis on the book ‘Bengaliidae du Monde (Insecta: Diptera)’. The proposed classification of Bengalia Robineau-Desvoidy, 1830 is rejected. All new family-group names, viz. Afridigaliinae Lehrer, 2005b; Gangelomyiinae Lehrer, 2005b (misspelled as Gangelomyinae) and Maraviolinae Lehrer, 2005b are sunk as junior synonyms of the tribe Bengaliini Brauer & Bergenstamm, 1889, new synonyms. All new genus-group names, viz. Afridigalia Lehrer, 2005b; Ashokiana Lehrer, 2005b; Kenypyga Lehrer, 2005b; Shakaniella Lehrer, 2005b; Tsunamia Lehrer 2005b; Bezzigalia Lehrer 2005b; Gangelomyia Lehrer 2005b; Laoziana Lehrer, 2005b; Temaseka Lehrer, 2005b and Maraviola Lehrer, 2005b are sunk as junior synonyms of Bengalia Robineau-Desvoidy, 1830, new synonyms. Bengalia ruedai Lehrer, 2005b is sunk as a synonym of Bengalia calilungae RUEDA, 1985, new synonym. Temaseka mallochi Lehrer, 2005b is sunk as a synonym of Bengalia concava Malloch, 1927, new synonym. Afridigalia adrianponti Lehrer, 2005b and Afridigalia falsimonia Lehrer, 2005b are sunk as synonyms of Bengalia floccosa (van der Wulp, 1884), new synonyms. Afridigalia lubana Lehrer, 2005b and Afridigalia sanaga Lehrer, 2005b are sunk as synonyms of Bengalia gaillardi Surcouf & Guyon, 1912, new synonyms. Afridigalia laguna Lehrer, 2005b and Afridigalia nusantara Lehrer, 2005b are sunk as synonyms of Bengalia inermis Malloch, 1927, new synonyms. Afridigalia jamesi Lehrer, 2005b and Afridigalia nicolasia Lehrer, 2005b are sunk as synonyms of Bengalia lyneborgi James, 1966, new synonyms. Afridigalia elgonia Lehrer, 2005b and Afridigalia olapana Lehrer, 2005b are sunk as synonyms of Bengalia peuhi Villeneuve, 1914, new synonyms. Maraviola erithreana Lehrer, 2005b is sunk as a synonymy of Maraviola seniorwhitei Lehrer, 2005b, new synonym. Maraviola smarti Lehrer, 2005b is sunk as a synonymy of Maraviola racovitzai Lehrer, 2005b, new synonym. Ochromyia Lehrer, 2005b is an objectively invalid name since it is a junior homonym of Ochromyia Macquart, 1835. Ochromyia jejutora Lehrer, 2005b and Gangelomyia senausmarta Lehrer, 2005b are unavailable names since they are published in synonymy. Afridigalia fanzideliana Lehrer, 2005b and Bengalia ruedai Lehrer, 2005b are unavailable names because no types have been designated. Numerous errors of fact concerning types, and numerous misinterpretations and outright ignorance of the working of International Code of Zoological Nomenclature are pointed out. No proposal has been made to select male neotypes for species now based on unrecognisable females types in order to preserve stability of nomenclature. 14 valid species are totally ignored for no reason at all, 7 valid species for dubious reasons, and numerous nominal species are left out of consideration completely. The genitalia illustrations are inadequate since only profile views are shown. Some of the newly described species seem to be based on artifacts in the illustrations of the male aedeagus or other organs, or on slight individual variation, and many seem to be synonyms of each other. Although describing many new species and creating the foundation for a rational taxonomy of a species-rich genus, Lehrer’s work ‘Bengaliidae du Monde (Insecta: Diptera)’ is an incomplete work that masquerades as a full taxonomic revision. It must be treated with the utmost caution and circumspection. Gegenstand der vorliegenden Publikation ist eine kritische Reflexion dreier unlängst veröffentlichte Arbeiten von Andy Z. Lehrer wobei der Schwerpunkt der Betrachtungen auf dem Buch ‘Bengaliidae du Monde (Insecta: Diptera)’ liegt. Die von Lehrer vorgeschlagene Klassifikation von Bengalia Robineau-Desvoidy, 1830 wird abgelehnt. Alle neuen Namen in der Familiengruppe, nämlich Afridigaliinae Lehrer, 2005b (= syn. nov.); Gangelomyiinae Lehrer, 2005b (fälschlich als Gangelomyinae, = syn. nov.) und Maraviolinae Lehrer, 2005b (= syn. nov.) werden als jüngere Synonyme der Tribus Bengaliini Brauer & Bergenstamm, 1889 aufgefasst. Die neuen Gattungsnamen Afridigalia Lehrer, 2005b; Ashokiana Lehrer, 2005b; Kenypyga Lehrer, 2005b; Shakaniella Lehrer, 2005b; Tsunamia Lehrer 2005b; Bezzigalia Lehrer 2005b; Gangelomyia Lehrer 2005b; Laoziana Lehrer, 2005b; Temaseka Lehrer, 2005b und Maraviola Lehrer, 2005b sind jüngere Synonyma (= syn. nov.) von Bengalia Robineau-Desvoidy, 1830. Bengalia ruedai Lehrer, 2005b (= syn. nov.) wird als Synonym von Bengalia calilungae RUEDA, 1985 erkannt. Temaseka mallochi Lehrer, 2005b (= syn. nov.) ist ein Synonym von Bengalia concava Malloch, 1927. Afridigalia adrianponti Lehrer, 2005b und Afridigalia falsimonia Lehrer, 2005b (= syn. nov.) sind Synonyma von Bengalia floccosa (van der Wulp, 1884). Afridigalia lubana Lehrer, 2005b und Afridigalia sanaga Lehrer, 2005b (= syn. nov.) sind Synonyma von Bengalia gaillardi Surcouf & Guyon, 1912. Afridigalia laguna Lehrer, 2005b und Afridigalia nusantara Lehrer, 2005b (= syn. nov.) sind Synonyma von Bengalia inermis Malloch, 1927. Afridigalia jamesi Lehrer, 2005b und Afridigalia nicolasia Lehrer, 2005b (= syn. nov.) sind Synonyma von Bengalia lyneborgi James, 1966. Afridigalia elgonia Lehrer, 2005b und Afridigalia olapana Lehrer, 2005b (= syn. nov.) sind Synonyma von Bengalia peuhi Villeneuve, 1914. Maraviola erithreana Lehrer, 2005b (= syn. nov.) ist Synonym zu Maraviola seniorwhitei Lehrer, 2005b. Maraviola smarti Lehrer, 2005b (= syn. nov.) ist Synonym zu Maraviola racovitzai Lehrer, 2005b. Ochromyia Lehrer, 2005b ist ein objektiv ungültiger Name weil er ein jüngeres Homonym von Ochromyia Macquart, 1835 darstellt. Ochromyia jejutora Lehrer, 2005b und Gangelomyia senausmarta Lehrer, 2005b sind nicht verfügbar, da sie als Synonyma publiziert wurden. Afridigalia fanzideliana Lehrer, 2005b und Bengalia ruedai Lehrer, 2005b sind nicht verfügbare Namen, weil kein Holotypus festgelegt wurde. Zahlreiche Irrtümer und Fehler, die sich auf die Typenexemplare beziehen, viele Fehlinterpretationen und falsche Auslegungen der Reichweite der Festlegungen des ICZN (1999) werden aufgezeigt. In dem in Rede stehenden Werk wurden keine Vorschläge zur Festlegung von männlichen Neotypen im Sinne der Forderung des Codes bezüglich der Stabilität der Nomenklatur für solche Arten unterbreitet, die auf nicht eindeutig interpretiertbaren Weibchen beruhen. Insgesamt 14 valide Arten werden von Lehrer aus unerfindlichen Gründen überhaupt nicht erwähnt, 7 weitere finden mit zweifelhafter Begründung keine Beachtung und viele weiter nominelle Arten werden völlig ignoriert. Die Abbildungen der Genitalien sind nicht ausreichend, da nur die Seitenansichten dargestellt werden. Manche der neu aufgestellten Spezies scheinen auf Artefakten bei der Zeichnung des Aedeagus oder anderer Organe oder aber auf geringfügigen individuellen Variationen zu beruhen und viele scheinen zueinander synonym zu sein. Obwohl der Autor zahlreiche neue Arten beschreibt und die Basis für eine vernünftige Interpretation einer artenreichen Gattung legt, muss Lehrer’s Buch ‘Bengaliidae du Monde (Insecta: Diptera)’ als eine unfertige Bearbeitung aufgefasst werden, die vorgibt eine tiefgründige taxonomische Bearbeitung zu sein. Es ist aufgrund der vielen Unzulänglichkeiten nur eingeschränkt nutzbar und mit größter Vorsicht anzuwenden. A new species of the genus Hydrophorus, Hydrophorus starkus Negrobov & Golubtzov spec. nov., from the Far East of Russia is described. The hypopygium is figured. The species is similar to Hydrophorus brunnicosus Loew on the basis of the morphology of the hypopygium. A modified key based on Negrobov (1977) is given. Eine neue Art der Gattung Hydrophorus, Hydrophorus starkus Negrobov & Golubtzov spec. nov., wird aus dem Fernen Osten Russlands beschrieben. Das Hypopygium wird abgebildet. Die neue Art ähnelt Hydrophorus brunnicosus Loew in Bezug auf die Morphologie des Hypopygiums. Ein modifizierter Bestimmungsschlüssel nach Negrobov (1977) wird gegeben.